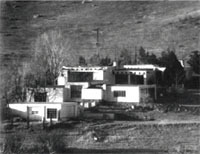 Dorothy Heller donated her 1930s-era 34 acre homestead where she and her artist husband Larry Heller lived for more than 60 years to UCCS. Frank Lloyd Wright remarked that it was the finest thing he saw in our city. Home restored with grant funds from Colorado Historical Society.